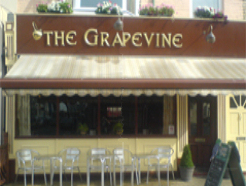 he Grapevine Restaurant is a well established restaurant just off the main high street of Redcar. With a welcoming relaxed atmosphere and friendly un-intrusive service ; The Grapevine has had many satisfied and returning customers..Offering a wide and varied selection of traditional and modern foods, all freshly prepared on the premises using the freshest and where possible local ingredients catering for a wide variety of tastes; including vegetarians and those with specific dietary needs. The Grapevine Restaurant is a combined coffee shop and bistro; the coffee shop is open Monday to Saturday during the day and the bistro is open Thursday to Saturday at night.